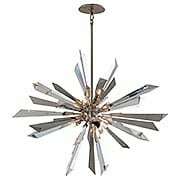 The Sparta 18-Light Chandelier delivers a burst of style to contemporary and traditional interiors alike. 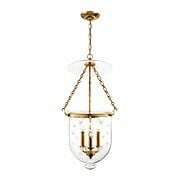 This bold fixture features javelins of icy, hand-poured glass bursting from a gleaming back plate and orbed arms. Whether displayed in your living room, dining room, or bedroom, the effect is dramatic! The Sparta Collection delivers a burst of style to contemporary and traditional interiors alike. 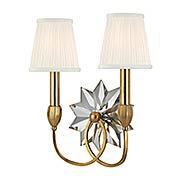 This bold wall sconce features javelins of icy, hand-poured glass bursting from a gleaming back plate and orbed arms. Whether displayed in your living room, dining room, or bedroom, the effect is dramatic! 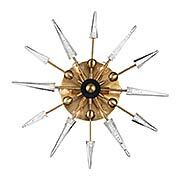 The Sparta 12-Light Chandelier delivers a burst of style to contemporary and traditional interiors alike. 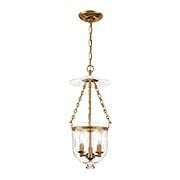 This bold fixture features javelins of icy, hand-poured glass bursting from a gleaming back plate and orbed arms. Whether displayed in your living room, dining room, or bedroom, the effect is dramatic! The Sparta Collection delivers a burst of style to contemporary and traditional interiors alike. 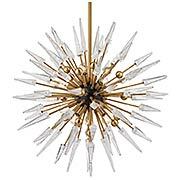 This bold flush-mount ceiling light features javelins of icy, hand-poured glass bursting from a gleaming back plate and orbed arms. Whether displayed in your living room, dining room, or bedroom, the effect is dramatic! The Inertia collection makes a huge statement with its collision of polished stainless and clear, crystal prisms. 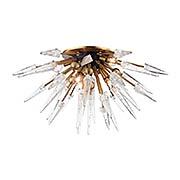 This pendant is constructed of hand-crafted iron, and features a shiny, silver-leaf finish and crystal diffusers. Bold and bright, it’s suited for a large, contemporary kitchen, entrance hall, or hotel lobby. 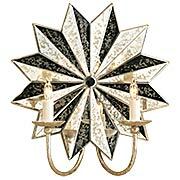 This delightful sconce adds a sparkling accent to your entryway, hall, or powder room. The handcrafted iron stars, boast a textured, antique silver-leaf finish and are topped with a crisp, hardback linen shade. The blink collection brings a burst of style to contemporary interiors. Featuring hand worked, wrought-iron rods in various lengths, this industrial-style sconce is finished in a rustic cottage bronze. It's a dramatic addition to any space. ADA compliant. 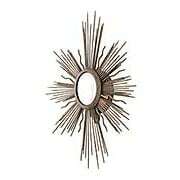 Artfully arranged, antique-mirror panels, and a silver-leaf finish frame converge to create this mod, stylized Starburst sconce. 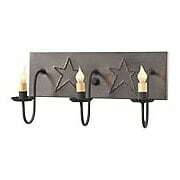 It's wrought-iron structure gives it a hand-made quality, while it's cream candle covers add the finishing touch. 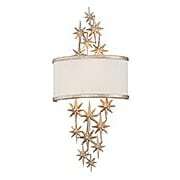 Glitzy and playful, it's a joyous accent for a any decor. Atomic's starburst design is a dazzling blend of premium materials and visual indulgence. 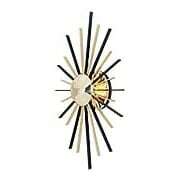 Constructed of solid brass and aluminum, this sconce features alternating bands of polished brass or nickel and matte black, creating a contrast that's truly eye-catching. 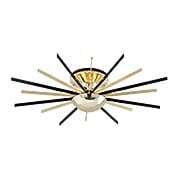 Brought together by a shining central orb, back plate, and LED lights, it brings an energetic vibe to any room. 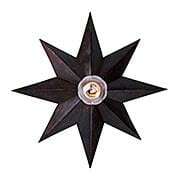 "Shopkeeper" style pendant with punched star design. 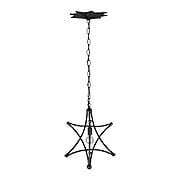 Fixture is made of tin with a blackened finish. Uses one 150 watt bulb. 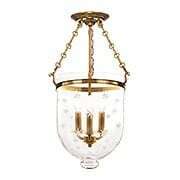 This punched tin vanity light is perfect for colonial or other rustic interiors. 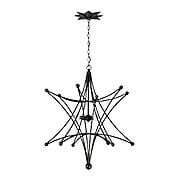 A bit of classic Americana, it features a hand-punched star pattern, dripping candles with crimped drip cups, and a blackened finish. Designed for use over a bathroom mirror, it's also charming over a kitchen sink. Handcrafted in Pennsylvania. The Inertia collection makes a huge statement with its collision of polished stainless and clear, crystal prisms. 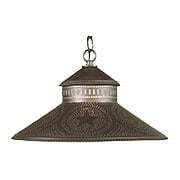 This flush mount is constructed of hand-crafted iron, and features a shiny, silver-leaf finish and crystal diffusers. Bold and bright, it’s suited for a smaller, contemporary kitchen, entryway, or dining room. The Inertia collection makes a huge statement with its collision of polished stainless and clear, crystal prisms. 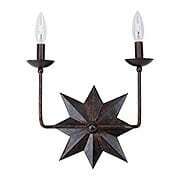 This flush mount is constructed of hand-crafted iron, and features a shiny, silver-leaf finish and crystal diffusers. Bold and bright, it’s suited for a contemporary kitchen, entryway, or hallway. The Inertia collection makes a huge statement with its collision of polished stainless and clear, crystal prisms. 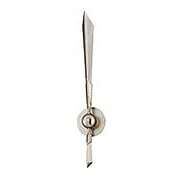 This pendant is constructed of hand-crafted iron, and features a shiny, silver-leaf finish and crystal diffusers. Bold and bright, it’s suited for a larger, contemporary kitchen, entryway, or dining room. 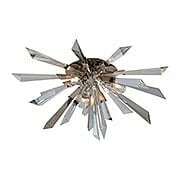 The Inertia collection sconce features polished stainless and clear, crystal prisms. 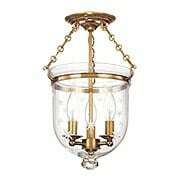 It’s constructed of hand-crafted iron with a shiny, silver-leaf finish and a crystal lamp diffuser. Bold and bright, it’s suited for a contemporary entryway or hallway. 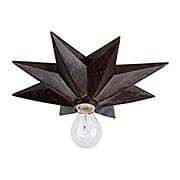 This punched tin vanity light is perfect for colonial or other rustic interiors. 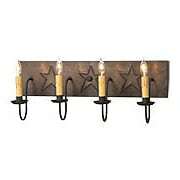 A bit of classic Americana, it features a hand-punched star pattern, stubby candles with crimped drip cups, and a blackened finish. Designed for use over a bathroom mirror, it's also charming over a kitchen sink. Handcrafted in Pennsylvania. 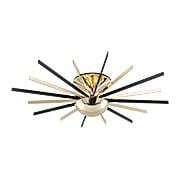 The Atomic 25-Inch LED Flush-Mount Ceiling Light's starburst design is a dazzling blend of premium materials and visual indulgence. Constructed of solid brass and aluminum, this fixture features alternating bands of polished brass or nickel and matte black, creating a contrast that's truly eye-catching. 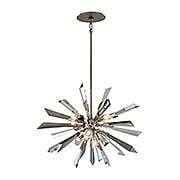 Brought together by a shining central orb, canopy, and LED lights, it brings an energetic vibe to any room. 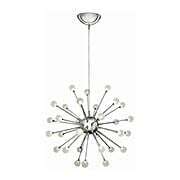 The Atomic 36 1/4-Inch Flush-Mount Ceiling Light's starburst design is a dazzling blend of premium materials and visual indulgence. 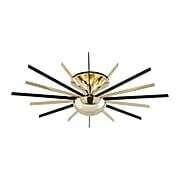 Constructed of solid brass and aluminum, this fixture features alternating bands of polished brass or nickel and matte black, creating a contrast that's truly eye-catching. 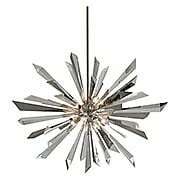 Brought together by a shining central orb, canopy, and LED lights, it brings an energetic vibe to any room.